Hurricanes May Be Getting More Severe — Do We Need a Whole New Category to Describe Them? Hurricanes are making more of an impact because of increasing development in coastal areas. There’s been a devastating trail of destruction and flooding along the east Atlantic coast in the last few weeks following Hurricane Harvey and now Hurricane Irma. The latter, recently moving across Florida, was the strongest sustained hurricane ever recorded in the Atlantic outside the Caribbean and Gulf of Mexico. Initially, Hurricane Irma was rated as a category five, losing energy along its path, with winds moving at 175mph (roughly 282kph) — destroying homes and causing power failure in the Caribbean. But given that Irma’s power has made some islands “barely habitable,” is category five really sufficient? Is it time to introduce a category six? We know that hurricane formation is affected by changes in sea surface temperatures — a warm ocean helps fuel hurricanes. This is partly driven by natural periodic and cyclic variations in the Earth’s climatic and oceanic systems, meaning that in some years the ocean is warmer than in others. Studies have presented mixed views of what will happen in the future with global warming. However, there are many consistent models and research articles indicating that there will be fewer hurricanes along the Atlantic coast, but that those that do form will be more severe — due to the warmer temperatures. However, it’s important to keep in mind that what we’ve seen recently, compared with decades ago, is not so much a change in hurricanes, but a change in impacts. Many coasts have become increasingly urbanized, and this trend is likely to continue. As with many small islands, much of the population of Barbuda, Guadeloupe, and others in the Caribbean are situated on the narrow coastal fringe — meaning they experience the full force of natural disasters, sometimes on scales never seen before. This means there is more infrastructure to be destroyed or damaged during extreme weather conditions than, say, to 100 years ago. The same could be said as Irma moved over Florida. Infrastructure on islands, such as harbors and airports, are key lifelines to the outside world — and any disruption to these can have serious consequences, potentially for many years. On small islands, infrastructure is partly there to support the economy (including tourism), which in turn provides further economic development, social welfare, and health benefits to the wider population. Take the infrastructure away as Irma has, and the economy declines leading to a shock. This is because, historically, small islands have been essential maritime or colonial hubs or trading posts. But today they are highly reliant on external trade, often through fisheries, agriculture, or tourism. Concentrating on one or two industries makes islands strong, but when extreme events or global disasters occur, the shock means they count the cost. Essentially, they have their eggs all in one basket. In Antigua and Barbuda, the total contribution of tourism to gross domestic product was 60% in 2016. Hurricane Andrew, also a category five event, made landfall in August 1992 — affecting the Bahamas and Florida. 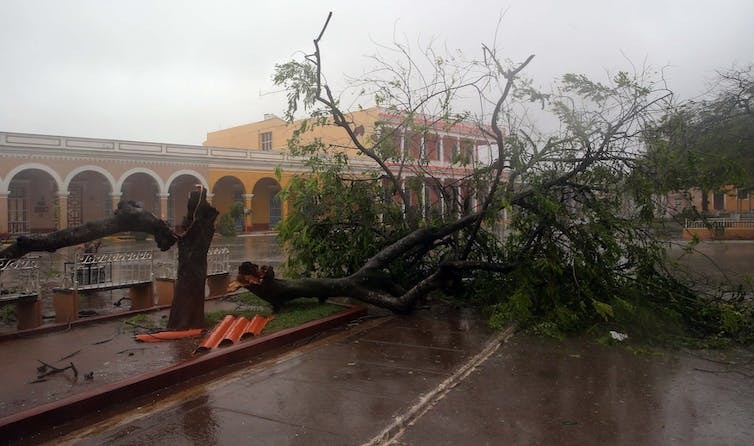 In the Bahamas, damage worth US$250m was reported, with projections of a decrease of 20% in tourist revenue, despite the vast majority of the islands surviving the hurricane. Luckily, advertising campaigns and repairs ultimately prevented the loss in tourist revenue. This is an important lesson about how to respond to such events. The 2015 Paris Agreement, which aims for nations to mitigate the effects of climate change, singles out small, developing island nations, many of which are in the Caribbean, as “particularly vulnerable” due to their “significant capacity constraints.” Irma has reminded the world that extra help is needed when an island state is partially destroyed. So will islands continue to suffer as a result of hurricanes — and will it get worse? In addition to warming temperatures and potential increase in future severity, the slow, but long-term effects of sea level rise could also increase the extent of flood impacts during and after extreme events. From 1901 to 2010, sea levels rose by about 1.9 millimeters a year. This is projected to accelerate, so that sea levels are about a meter higher in 2100 than today. Over a century, sea-level rise could make the difference between minor and major flooding, and the longevity of impacts. Indeed, long-lasting impacts may provide impetus for introducing a category six of the Saffir-Simpson Scale. This could describe cases that have a permanent effect on living conditions — potentially making some areas permanently uninhabitable. Such effects are currently not accounted for on the scale.